Watching the Oscars is a very predictable thing. There will be lots of beautiful ladies with beautiful robes trying not to fall over, looking all gorgeous. Well most of them. There will be lots of guys looking very dapper in their suits. And there is Benedict Cumberbatch. Of course he looks very dapper in his Spencer & Hart suit and we all were relieved seeing his hair curling and going back to his natural colour (yes there is a bit of grey in it). It seems that Benedict really enjoyed being on the Red Carpet, THE reddest and most important carpet existing in film industry. Looking relaxed, happy and smiling all over his face, he actually belongs there, in the middle of all of these stars who all pretend being very important and very Hollywood -ish. Benedict rules them all. “It’s a non stop party. Despite the fact that he wasn’t nominated for an Oscar and Cumbercollective is sure he will be in for one next year probably for the upcoming film about Alan Turing “The Imitation Game”, Benedict was the hidden winner of the ceremony. Yes, he presented Catherine Martin together with Jennifer Garner for the award for best production design for The Great Gatsby. He cried during Lupita Nyong’s accepting speech for best supporting actress, he smiled and laughed on stage together with the crew of “12 Years a Slave” and couldn’t stop smiling through all the interviews he gave before and after the ceremony. 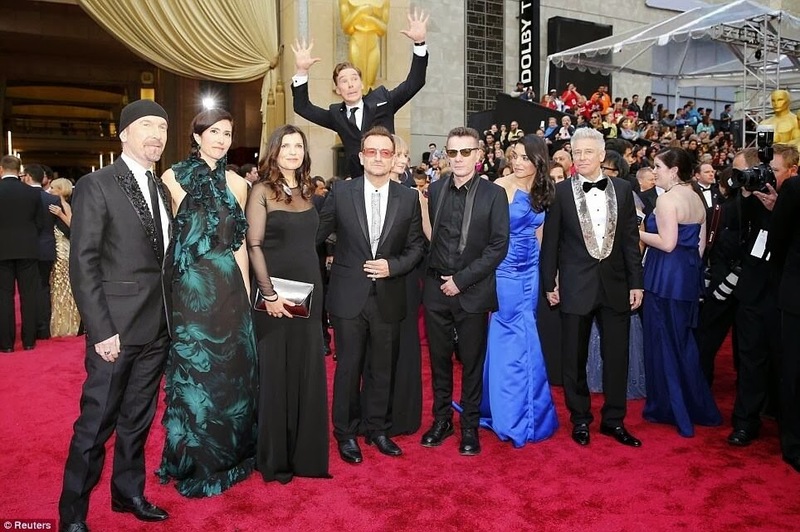 Benedict seemed to be and still is all over the internet and especially twitter went mad when fans realized that he really was photobombing U2, giving nothing at all to ceremonial rules by being DorkyBatch and apparently being very proud of himself. 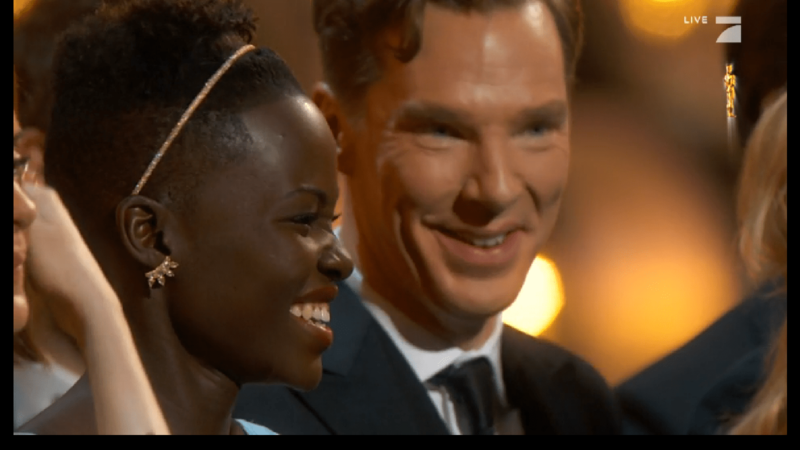 A feeling he shared with his fans lots of them watching the Oscar broadcast no matter how late or early it was due to timeshift, giggling and smiling with their beloved man, demanding only one thing: Please don’t behave like an adult, Benedict, and give us more of your DapperDorkBatch. 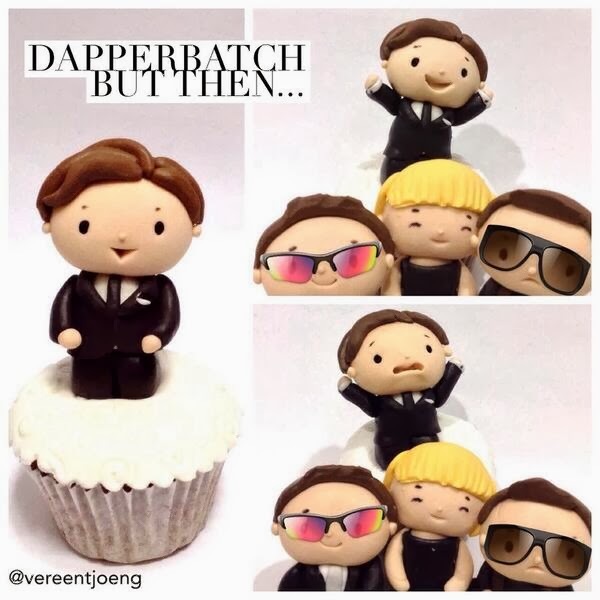 You’ll get more of these writings and more Cumbercupcakes, ehm Muffins as you name them.